Once upon a time, there was only one view for the Media Library. It was a table listing all your media, and grid view was nothing more than a dream. A few years ago, that all changed, and the media grid became the primary view for the Media Library, with list mode relegated to the back seat. Unfortunately, this meant that advanced tools for optimizing your media and viewing optimization statistics were now hidden in that "back seat". But never fear, List Mode is only a click away! Once you click the List icon (on the left), you'll have access to several new features. The most obvious options are in the Image Optimizer column. The Show Metadata button is only available when debugging mode is active, but it will show you the attachment metadata from the database (if you like that sort of thing...). More importantly, we have options to optimize/re-optimize, restore, and convert our images. As you may be aware, EWWW IO won't normally re-compress an image that it has already processed. The Bulk Optimizer will let you override this with the Force Re-Optimize option, but if you just want to do individual images, the Re-optimize links here are the equivalent of a "forced override". You have an active API key with image backups enabled. You've converted an image and left the originals intact (Delete Originals disabled). Also of note is that this allows you to see how many sizes/thumbnails each image has. This number includes the original, so if there are 5 thumbs, it will say "6 sizes to compress". Additionally, you can view the optimization details for an image by clicking the little + symbol. Lastly, there's one more trick we can find in List Mode. 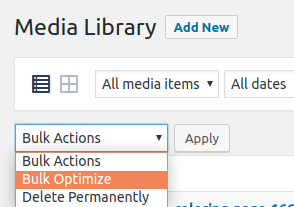 If you click the Bulk Actions drop-down menu, you'll find a Bulk Optimize option. This allows you to optimize batches of images, from entire pages, to just a handful of images. Pro tip: clicking on Screen Options near the top-left corner of the library will allow you to toggle the columns displayed AND increase the number of images displayed per page. Now you know, so go out and optimize some images, happy optimizing!